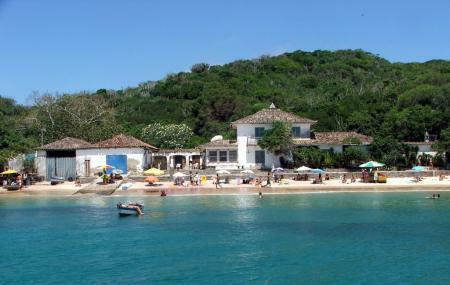 One of the most elegant and charming beaches in Armacao dos Buzios, the Azeda Beach is located to the east of the town. The small beach is known for being crowded during summers but on any other day, you can find a spot for yourself to relax and rejuvenate with the sun, good food and a few drinks. Enjoy the sensational sunsets here with a few drinks and you have the perfect way to end the day in the town. Carry sunscreen, drinking water and any other beach essentials you may need. How popular is Azeda Beach? People normally club together Joao Fernandes Beach and Armacao Beach while planning their visit to Azeda Beach. Beautiful beach with a little natural pool for kids to hang out in but... It's a popular party beach with a boat that is anchored and pumping out discotech beats (even at 9 am!). We were early so we got a spot but within an hour there was barely walking room on the beach and our blankets were touching other people's blankets. Also, the number of people taking selfies is through the roof. I'm all for a good selfie but there were people lined up at certain spots!!! Mind you I went on a weekend, maybe it's a little more mellow during the week. Amazing!! The drinks were very good!! Strong too. During the week the beach was not crowded. Beautiful!!! Clean! But small and crowded.